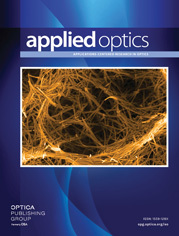 The authors are with the Faculty of Applied Physics, Eindhoven University of Technology, P.O. Box 513, 5600 MB Eindhoven, The Netherlands. Laser-induced fluorescence (LIF) spectroscopy is introduced as an in situ diagnostic for phenol and intermediate products in an aqueous solution degraded by corona discharges. The complications that are inherent in applying LIF as a diagnostic for aqueous solutions are experimentally examined. The LIF intensities of phenol and the intermediate products are measured as a function of time. The absolute phenol concentration is determined. We confirm the applicability of LIF spectroscopy for monitoring phenol concentration during degradation.